Product of a shared passion for design, craftsmanship and performance, the new VERTU Ti Ferrari Limited Edition showcases the closest collaboration yet in six years of Vertu and Ferrari's partnership. This latest handset embodies the unique DNA of VERTU Ti, but is closer to the unmistakable materials, design and sounds of Ferrari than any other Vertu Ferrari phone. Reflecting the sweeping rear curves of the Ferrari F12berlinetta, the pillow of the VERTU Ti Ferrari has been crafted from Alutex – a special lightweight composite weave used to stunning effect on Ferrari interiors and painstakingly colour-matched to the red Ferrari leather using a new technology unique to Vertu. 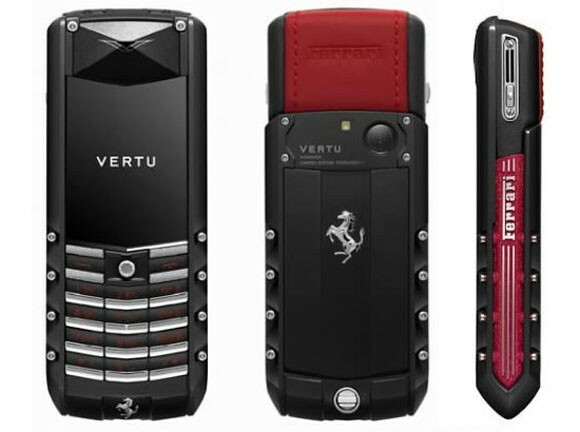 In another first, two Ferrari leathers – Red and Black – form a dynamic stripe around the casing of the phone. Stitched in the same style as Ferrari seats, the soft leathers – as found in Ferrari GT cars – were specially treated by Vertu to be strong enough to withstand the rigors of use on a mobile phone. Following the sweeping design cues from the rear of the Ferrari F12berlinetta, even the most challenging aspects of the phone’s back plate have been specifically styled to mirror the car. The iconic tail lights have inspired the specially rounded camera housing while even details that may go unnoticed – such as the tiny hexagonal screws holding the back plate – are unmistakably Ferrari. Ten times harder than stainless steel and incredibly light, Ferrari uses Diamond Like Carbon (DLC) coating to guard engine and transmission components against constant extremes of heat and friction. As ultimate protection for your phone, Vertu has treated the surfaces most exposed to frequent contact with the same super strong, yet stylish coating. From the clarity of its 3.7” sapphire crystal screen, to the strength and lightness of the grade 5 titanium casing, the VERTU Ti Ferrari has been handcrafted using VERTU Ti design DNA throughout. Even beneath the surface, the experience of Vertu’s uniquely curated services on the Android™ platform makes this a true icon of Vertu design and performance. Vertu is the pioneer and leading manufacturer of luxury mobile phones, handmade in England. Created to complement the discerning customer’s lifestyle, Vertu offers tailored, luxury services in combination with the finest in design, engineering and manufacture. Offering luxury lifestyle assistance and enrichment, Vertu Concierge is an independent, tailored service available 24 hours a day, worldwide. Vertu City Brief is a global digest of information, recommendations and protocol in more than 140 cities and destinations worldwide available on the handset. Vertu uses innovations in manufacturing technology with traditional craftsmanship, assembling each phone at the company’s headquarters in England. Vertu is available in over 500 stores, including over 80 Vertu boutiques, in 60 countries worldwide.